Definition at line 54 of file _iosfwd.h. Definition at line 169 of file _sstream.h. Definition at line 168 of file _sstream.h. Definition at line 171 of file _sstream.h. Definition at line 170 of file _sstream.h. Definition at line 162 of file _sstream.h. Definition at line 163 of file _sstream.h. Definition at line 165 of file _sstream.h. Definition at line 164 of file _sstream.h. Definition at line 166 of file _sstream.h. Definition at line 417 of file _sstream.c. Definition at line 425 of file _sstream.c. Definition at line 432 of file _sstream.c. Definition at line 181 of file _sstream.h. Definition at line 184 of file _sstream.h. Referenced by LocaleTest::_time_put_get(), operator<<(), RequestHandler::process_invalid_request(), RequestHandler::process_root_request(), and RequestHandler::process_valid_request(). Definition at line 185 of file _sstream.h. Definition at line 189 of file _sstream.h. 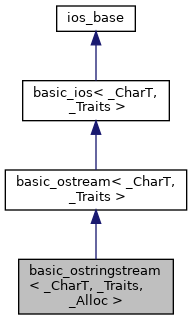 Referenced by basic_ostringstream< _CharT, _Traits, _Alloc >::rdbuf(), and basic_ostringstream< _CharT, _Traits, _Alloc >::str().